WWE’s second biggest show of the year and the biggest party of the summer ... it’s SummerSlam! Coming from the Barclays Center, the main event shakes the foundations of Brooklyn when Brock Lesnar defends the Universal Championship against Roman Reigns, Braun Strowman and Samoa Joe in a Fatal Four Way Match. And “The King of Strong Style” Shinsuke Nakamura gets his first chance at WWE gold when he faces “The Modern-Day Maharaja” Jinder Mahal for the WWE Championship. Plus much more! Second only to WrestleMania, SummerSlam is one of the most exciting and hotly anticipated events in the WWE calendar, and this year’s edition was earth-shattering! The Universal Championship Fatal Four Way is simply electric, with four of WWE’s most powerful Superstars demolishing each other for a chance to hold Raw’s number one title. Particularly impressive is Braun Strowman’s man-handling of “The Beast” Brock Lesnar – a moment that turns the “Monster Amongst Men” into an unlikely anti-hero! But it’s far from a one-match show, as there’s incredible action from top to bottom! Sasha Banks proves she really is The Boss as she tries to win her fourth Raw Women’s Championship. Baron Corbin challenges the veteran 16-time champ John Cena in a sizzling match-up. And Shinsuke Nakamura tries to overcome the odds by striking Jinder Mahal and the Singh Brothers wit his patented “Strong Style”! There’s also major drama as Shane McMahon referees a heated grudge match between AJ Styles and Kevin Owens over the United States Championship. Shane promises to call it down the middle, but anything can happen in WWE. Also unmissable is the reunion of former Shield brothers Seth Rollins and Dean Ambrose, plus Finn Bálor unleashing the “Demon” on Bray Wyatt! Be sure to pick up this historic night of action on DVD & Blu-ray! 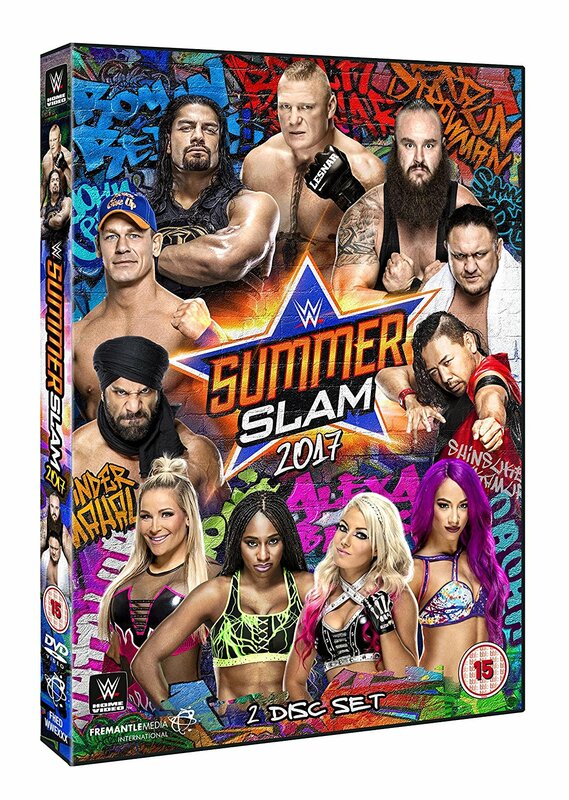 SummerSlam 2017 will officially be released on DVD and Blu-ray on Monday October 9 2017.